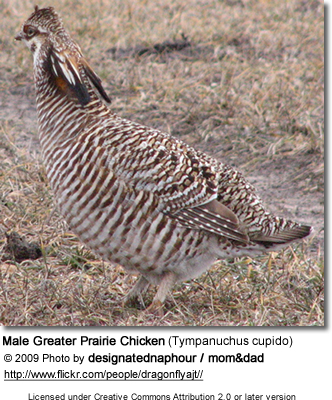 The Greater Prairie-Chicken, Tympanuchus cupido, is a large bird in the grouse family. This North American species was once abundant, but has become extremely rare or extinct over much of its range due to habitat loss. There are current efforts to help this species gain the numbers that it once had. One of the most famous aspects of these creatures is the mating ritual called booming. The Heath Hen, Tympanuchus cupido cupido, which was historically found along the Atlantic coast is extinct. It was possibly a distinct species; in this case the two other forms would be T. pinnatus pinnatus and T. p. attwateri. 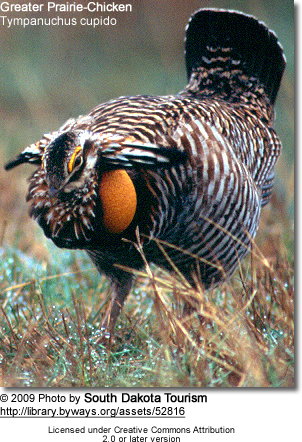 Attwater's Prairie Chicken, T. c. attwateri is endangered and restricted to coastal Texas. 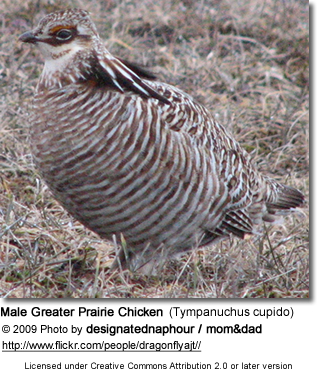 The Greater Prairie Chicken, T. c. pinnatus, is now restricted to a small section of its former range. Adults of both sexes are 14 inches (360 mm) long, medium sized, stocky, and round-winged. Their tails are short, round, and dark. Adult males have a yellow-orange comb over their eyes. Males also have dark, elongated head feathers that can be raised or lain along neck. A circular, orange unfeathered neck patch can be inflated while displaying. Adult females have shorter head feathers and lack the male's yellow comb and orange neck patch. 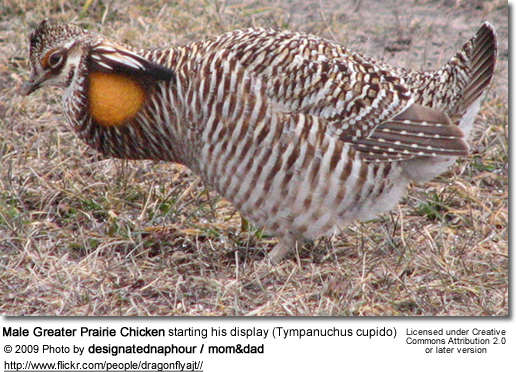 Greater Prairie-Chickens prefer undisturbed prairie and were originally found in tall grass prairies. They can tolerate agricultural land mixed with prairie, but the more agricultural land the fewer prairie-chickens. These birds were once widespread all across the oak savanna and tall grass prairie ecosystem. 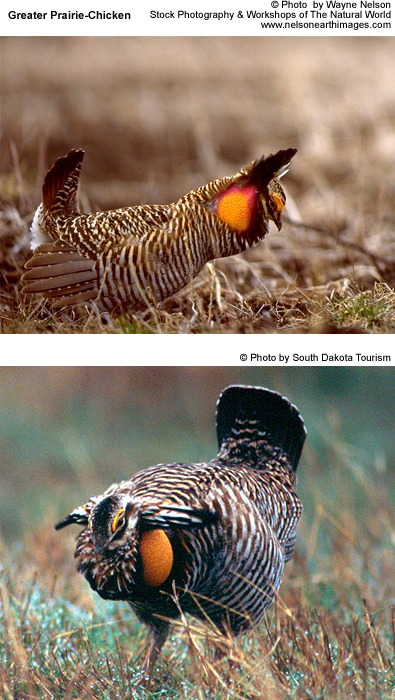 The Greater Prairie-Chicken was almost extinct in the 1930s due to hunting pressure and habitat loss. They now only live on small parcels of managed prairie land. It is thought that their current population is about 459,000 individuals. In May 2000, the Canadian Species at Risk Act listed the Greater Prairie-Chicken as extirpated in its Canadian range (Alberta, Saskatchewan, Manitoba, Ontario). 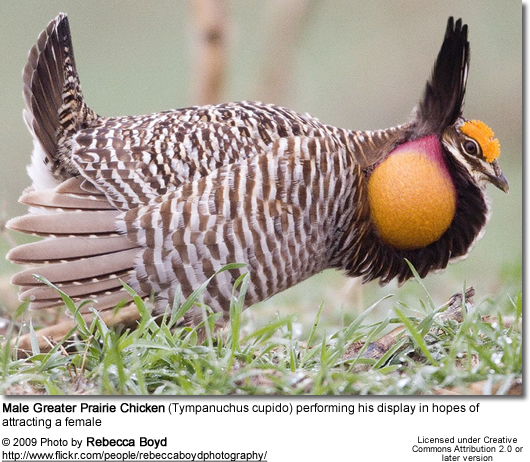 The Greater Prairie-Chicken is not threatened by severe winter weather. When the snow is thick they "dive" in to the snow to keep warm. A greater threat to the prairie-chickens comes in the from of spring rains. These sometimes drenching rains can wreak havoc on their chicks. Another major natural threat is drought. A drought can destroy food and make it difficult for the chicks. Human interactions are by far the greatest threat. The conversion of native prairie to cropland is very detrimental to these birds. It was found in a radio telemetry study conducted by Kansas State University that "most prairie-chicken hens avoided nesting or rearing their broods within a quarter-mile of power lines and within a third-mile of improved roads." (Kansas Department of Wildlife and Parks) It was also found that the prairie-chickens avoided communication towers and rural farms. Greater Prairie-Chickens do not migrate. They are territorial birds and often defend their booming grounds. These booming grounds are the area in which they perform their displays in hopes of attracting females. Their displays consist of inflating air sacs located on the side of their neck and snapping their tails. These booming grounds usually have very short or no vegetation. The male prairie-chickens stay on this ground displaying for almost two months. The breeding season usually begins in the United States starting in Late March throughout April. During this time the males establish booming sites where they display for the females. The one or two most dominant males will do about 90% of the mating. After mating has taken place, the females will move about one mile from the booming grounds and begin to build their nests. Hens lay between 5 and 17 eggs per clutch and the eggs take between 23 and 24 days to hatch. There are between five and 10 young per brood. (INRIN, 2005). The young are raised by the female and fledge in one to four weeks, are completely independent by the tenth to twelfth week, and reach sexual maturity by age one (Ammann, 1957). One problem facing prairie-chickens is competition with the Ring-necked Pheasants. Pheasants will lay their eggs in prairie-chicken nests. The pheasant eggs hatch first; this causes the prairie-chickens to leave the nest thinking that the young have hatched. In reality the eggs did not hatch and the young usually die because the mother is not there to incubate the eggs.